The Best Sling Patio Bar Stool - You Will Want to Stay in the Landings! There is a lot to be said for the simple things in life, especially when so much of life seems very complicated. One thing you don't want complicated is your leisure time; down time should be just that. 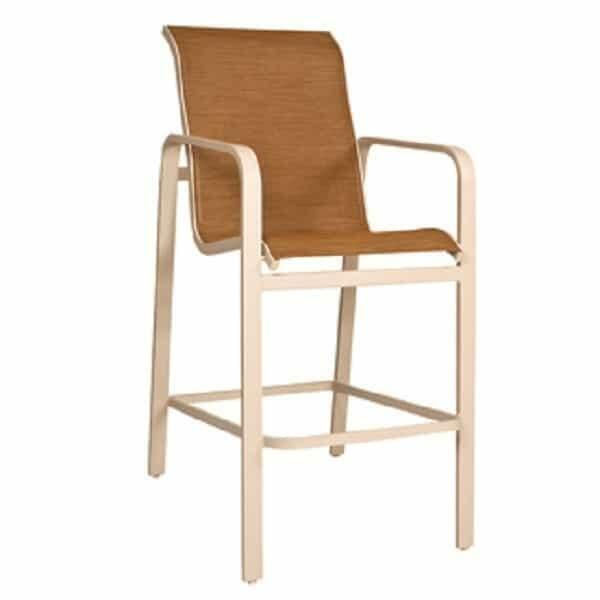 The Landings Sling Bar Stool by Woodard is simple and simply perfect. It is a stationary barstool, the perfect solution for a poolside bar or bar table. It is easy to use, easy to maintain; simple. But just because it is plain don't assume it isn't sturdy and built to last through season after season of use and abuse. Just like all of the patio furniture crafted by Woodard, the Landings Sling Barstool is top-shelf. Constructed with the highest quality aluminum alloy and protected by an electrostatically applied powder-coated finish, the Landings Sling Bar Stool is proof that 140 years in the furniture business teaches you a thing or two. And don't forget the PVC coated chlorine, rain, sun, fruit punch, wet towel, sunscreen friendly slings. The Landings Sling Barstool is customizable, available in a variety of frame finishes and coordinating sling fabrics. The simple life is the good life. W 24.3" x D 32" x H 49" SEAT HEIGHT 31"
W 24" x D 29" x H 35.3" SEAT HEIGHT 17.5"
W 29.8" x D 75.5" x H 22.8" SEAT HEIGHT 15"